9 tracks: The Long Note * Caber Feidh * The Fair Maid of Takla Makan * The Braes o’ Balquidder * The Oyster Wives’ Rant * You’re Welcome Home, Grainne * Oranmore * Caledfwich * The Old Pipe Reel. Pumping out a second slab of untamed Celtic electro beat for your ears and feet, supercharging the trademark grooves, samples and loops with stunning live playing by top Scottish musicians. 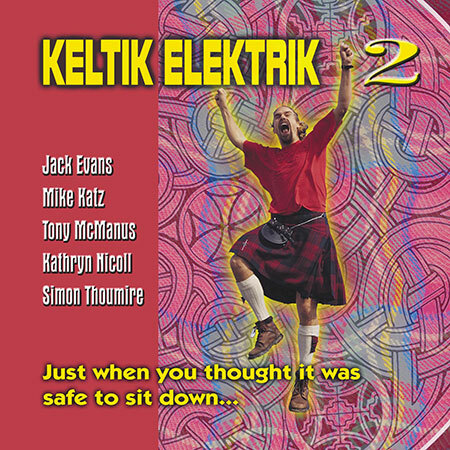 Driving fiddle, swaggering pipes, feral guitars, wailing whistles, quicksilver concertina plus pumping beats bass and keys all combine to make Keltik Elektrik 2 one of the most unsitdownable Celtic albums of the year. In 1998 Greentrax released the Keltik Elektrik Edinburgh Hogmanay Party Mix, directed at the dance, club and party scenes. As before, the musician behind the project is multi-instrumentalist Jack Evans of Jock Tamson’s Baims, Easy Club and Cauld Blast Orchestra fame. The album is 100% instrumental and consists of an incredible mix of sounds, styles and rhythms - with a beat to suit the most energetic club dancer! Jack Evans with Kathryn Nicol (fiddle), Battlefield Band’s Mike Katz (pipes), Tony McManus (guitar) and Simon Thoumire (concertina).